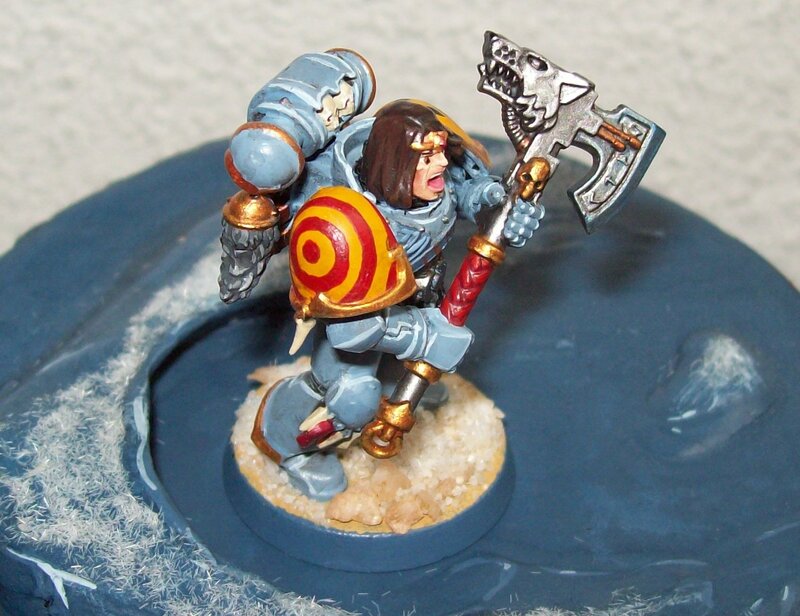 Just a quick aside, there should be a longer post later, but I was quite pleased with this guy’s power axe. I’m not entirely happy with the model as he’s a bit wobbly in places and something went badly wrong with the wash but the axe looks quite ok. I wanted to give the effect of a glowing power axe. Maybe blue would be more appropriate for a frost blade, but as this guy’s a Blood Claw he can’t take one anyway, so it shouldn’t cause confusion. The axe is painted using Boltgun metal, highlighted with Chainmail and Mithril Silver (I don’t know the new paint names yet). I used the new Citadel Guilliman Blue glaze for the effect, which, although I can’t get it to work in the photo, does change intensity as the light direction changes.